Thanks. You should. It’s the first floor of the Youth Hostel in Cortona. Great to have met you and look forward to following you in 2014. This was my husband’s view when he woke up in the mornings, for four years … 1958 — 1961! when he studied at Redemptorist seminary Saint Alfonso which is now the hotel Oasi. Wonderful. Thanks for the visit. Lovely to meet you. It is a magical view. I hope your dream becomes a reality. Thank you. 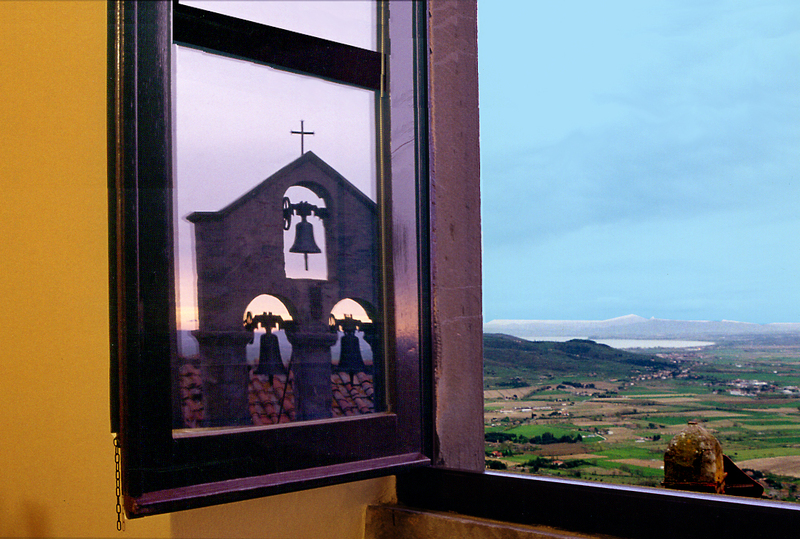 The reflection of the bells across the street appeared when I opened the window to enjoy the view of the valley. A very magical moment. I have the sense of an opening to an inner landscape. A thoughtful and beautiful image. Absolutely marvelous shot – 3 in one – love it! Thanks Tina. One of those perfect moments.